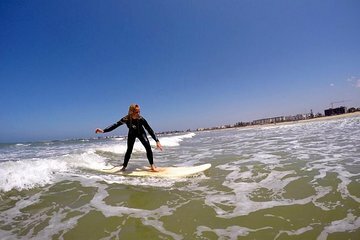 Explore the best of Moroccan surfing in the serene coastal city of Essaouira on this guided, full-day tour from Marrakech. Located on Morocco’s Atlantic Coast, this walled port city — a late-18th-century fortified town — includes a fishing harbor (with an abundance of seagulls always soaring overhead) and a medina full of local artists selling their wares. Find the best surf spots based on ability and enjoy a 2-hour lesson. Following lunch (not included), explore the city on foot. Surfing equipment and a Marrakech hotel pickup and drop-off are included. Best day ever! The tour was outstanding. An amazing guide took us to Essaouria and gave his best effort to really make us surfing plus showed us amazing views in the city as well. All equipment included and everything perfectly planned. We would definitely book the same trip again and again. The Surf Trip to Essaouira was one of the highlights to my trip to Morocco. Karim, our guide, was pleasant, flexible, and a lovely personality. While I felt that we had a nice varied day of sightseeing and surfing, Karim was flexible in terms of plans. When he needed to switch our tour day he gave maximum options. As a first time surfer, I appreciated Karim's patience and clear instructions. I was worried that I wouldn't like surfing, but I am now thinking of ways to incorporate surfing into all of my trips. Overall, I would book Karim's two day trip next time, and I will recommend this tour to all friends who travel to Morocco. Our surf day was an unbelievable memory.